Wednesday, March 25 Potluck: Dinner 6:00 p.m.
Everyone is welcome to all of these events. The intestinal flu virus seems to have taken its toll this year, flying around the Island and biting just about everyone at one time or another. There were so many children (and adults) sick for the last two days that school was canceled on one day and the children were sent home on the second day. No school for Monday and Tuesday of this week due to illness. The deadline for Citizen of the Year nominations is Saturday April 4. 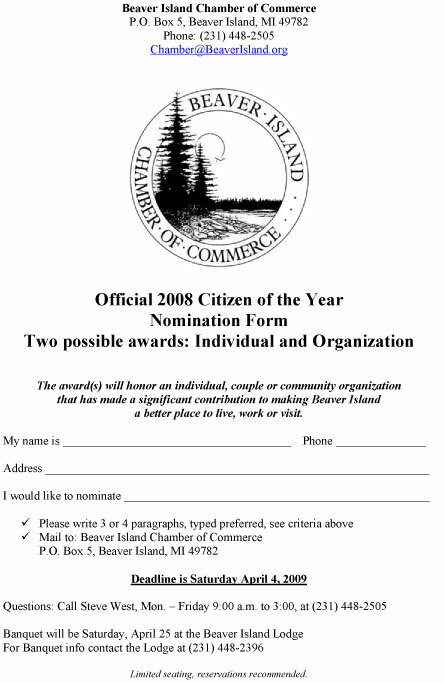 Forms are available at the Chamber of Commerce office in the Community Center and on the web at www.BeaverIsland.org . The award(s) will honor an individual, couple or community organization that has made a significant contribution to making Beaver Island a better place to live, work or visit. Anyone can make a nomination. The nine members of the Chamber of Commerce board of directors select the annual winner(s). Anyone can make a nomination. You don't have to be a member of the Beaver Island Chamber of Commerce. This year's award, for 2008, will be the 8 th annual presentation. For additional award or banquet information contact the Chamber at (231) 448-2505 or Chamber@BeaverIsland.org . Are You Ready for the Mud? Perhaps the least popular season on Beaver Island is the Mud Season. Yes, we know that this season leads to real springtime and, eventually, to summer, but mud is not the friend of most who live down the gravel roads and who own gravel-clay mix driveways. Beaver Island had its first true mud days on Friday and Saturday, the 6th and 7th or March 2009. It was necessary to walk through mud puddles, squishy mud, and slippery mud to get to and from your car or truck, no matter where you parked it, except in the few paved parking areas of the Island. If you have a favorite mud story, we would be happy to receive it and share it. From an old college friend, who was a composer and lyricist: "Mud, mud, glorious mud, Nothing quite like it for soothing the blood, For here we can follow, into the holler, and then we can wallow in glo-oo--rious MUD." At two in the morning on March 8, 2009, Michiganders and other midwesterners, were to switch there clocks from 2 a.m. to 3 a.m. to make the change back from Daylight Savings time. Did you remember to make the changes before you went to sleep? If not, you were probably late for your Sunday morning appointment at church or the trip to the store. Did the daylight savings time have any effect on your psyche? One of the reasons for changing the clocks is to make certain that our children were not going to school in the dark. Did that happen? Do you have any other logical reasons for making this change? Did it save any money on fuel for heating or lighting? What are your reasons to support or you failure to support daylight savings time? This holiday, probably more than any other, is the holiday for the Beaver Islanders that tops the others. There is more music, more opportunities for good, clean fun, and certainly plenty of opportunity for celebrating the Day. 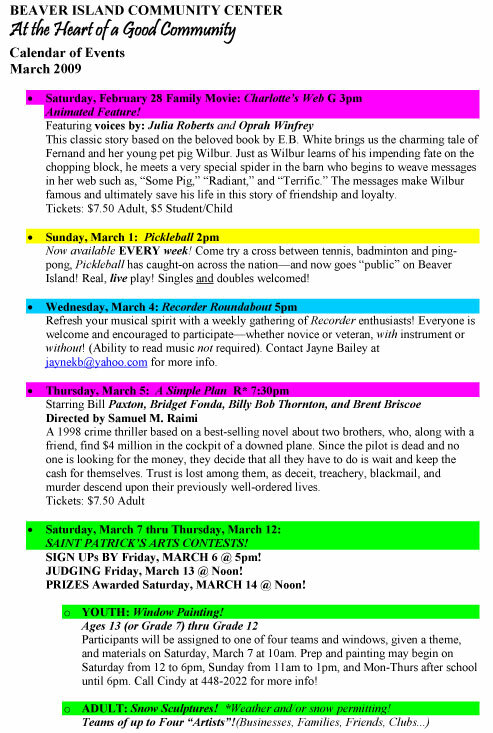 All of the Island bands will be performing at one play or another. 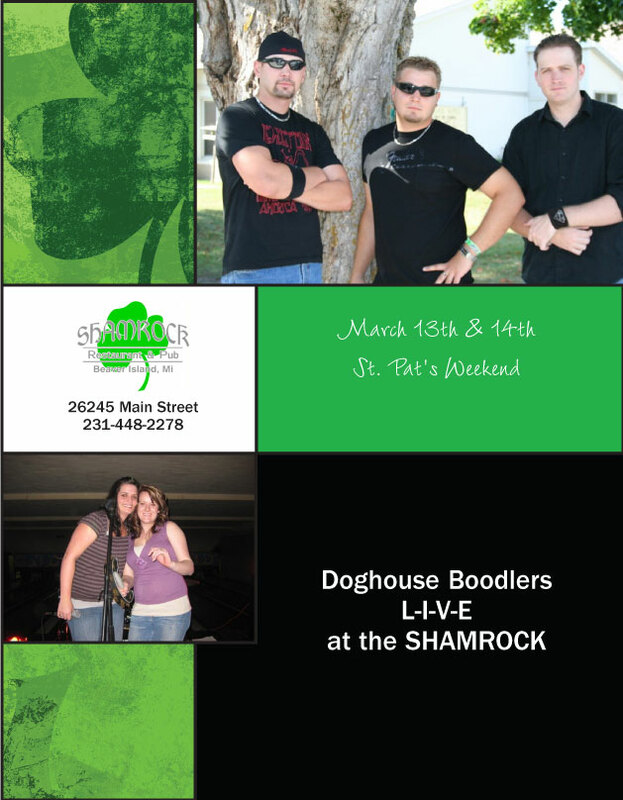 Island Souls, Danny and Danny and guests, the Boodlers, and Rigormortis will all be performing this St. Pat's weekend. The St. Pat's Day games will be taking place and there are special activities planned at the Beaver Island Community Center. Read more about the activites below. Here is a challenge for those of your who into trivia and seeing how observant you are. On Beaver Island, during St. Pat's Day, there are plenty of shamrocks to be found including the main one on the front of the Shamrock Bar and Restaurant. Here are two shamrocks that are to be found permanently on the island for 365 days of the year. One is in St. James Township and one is in Peaine Township. Can you tell the locations of these two shamrocks? We'll be doing something special! " You never know what you might see!" Margaret “Muggs” Bass has recently been diagnosed with a cancer reoccurrence. To help defray her travel and medical expenses there will be a 50/50 Raffle with the drawing to be held at the Shamrock at 6:00 P.M. on Saturday, March 14,2009. The tickets are $1.00 each or 6/$5.00. Tickets are available at local merchants on the island . If you send a check, we will fill out the tickets for you since we are short on time. Please keep Muggs in your prayers. 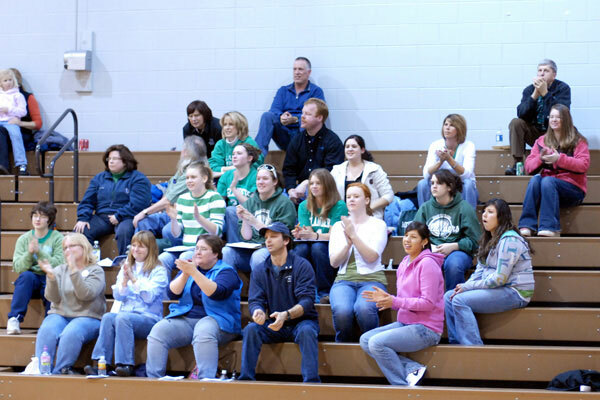 This fundraising event for the Beaver Island Sports Boosters occured on Wednesday, March 4, 2009. The food portion of the night was scheduled to begin at 5:30 and ended at 7:30 and included the chili, cornbread, and desert. Drinks were to be purchased from the Shamrock. Thank you to those who cam and supported our Island athletes and the athletic program of the Beaver Island Community School. The AMVETS Post #46 Ladies Auxiliary will raffle off a Corned Beef Dinner on Friday, March 13. The Dinner will include everything needed for a boiled corned beef dinner, as well as an American flag and an Irish flag. 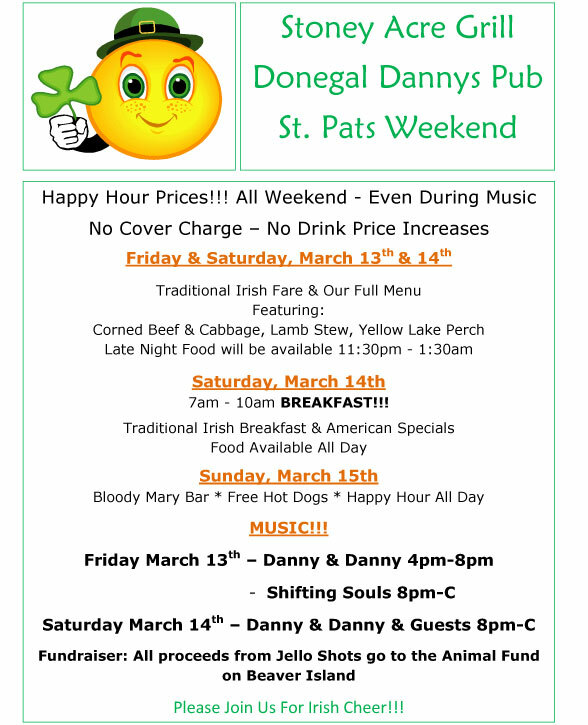 Ticket sales will be from 5:00 to 7:00 PM at the Shamrock, Beachcomber and Donegal Dan's Pub, with the drawing shortly after 7:00 at the Shamrock. Tickets are $1.00 each or 6/$5. Look for these ladies to buy a chance on a good old-fashioned Irish meal. Some Island residents, former or current, are doing well despite some serious health issues. Phil Gregg is being transferred to Northern Michigan Hospital's cardiovascular unit. Joddy Croswhite was hospitalized at Munson Medical Center, but is now home and doing much better. Welcome home, Joddy and Beth! Lauraine Dawson is home now. Paul Nelson, who broke his leg three weeks ago, is at home at 5460 Woodcock Drive, Belmont 49306, with plans to move into a senior assisted living facility in the future. Leone Schellenberg was reported to have had a heart attack, but is doing okay at this point. Perry J. Palmer (Budger)is in the Grand Rapids Home for Vets, Room 382-Red, 3000 Monroe Ave., Grand Rapids, MI 49505. An eleven movie winter film series continues at the Beaver Island Community Center, presented by a new movie club, the Beaver Island Film Fans. Twenty-three Film Fans club members worked together to nominate a list of their favorite movies, and then voted to select their top eleven films to make up the series. Movies in the series range form 1940 to 2007 in age, range from romantic comedy to thrillers, westerns to epic adventures, and international hits to edgy art. Included in the series is the American Film Institute's #1 American film, Citizen Kane. 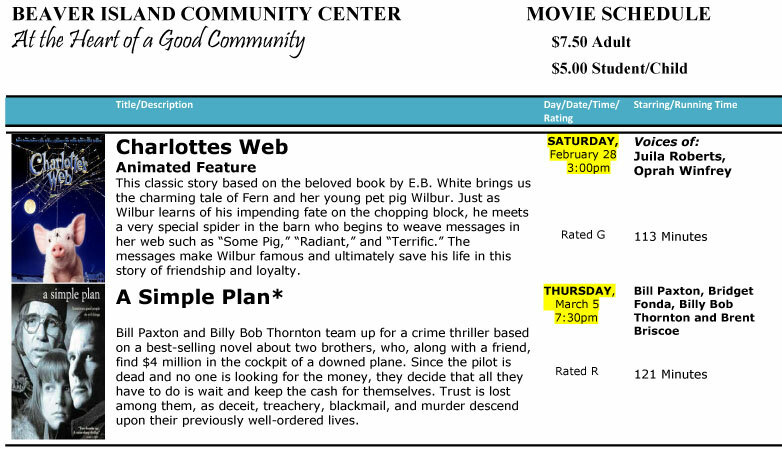 The club's membership dues will be used to pay for the theatrical performance rights for the films.  Mondays 12 pm - BINGO!  Tuesdays 12 pm – Board Games!  Wednesdays 10:30 am - Wii! Come experience the “Wii World”! From bowling to balance, golfing to “gaming” and—virtually!—everything in between!  Thursdays 12 pm – Cards!  Fridays 12 pm – Pickleball! Come try a cross between tennis, badminton and ping pong! Singles or doubles! Great food, company and fun for the whole community! Look for new things every month! This month features pork roast, mashed potatoes, coleslaw and apple cobbler. Suggested donation for Seniors 60 and older is $3, and those under 60 $6.  March 7-12 St. Patrick's Snow Sculpting Contest! Sign up on a team by March 6! 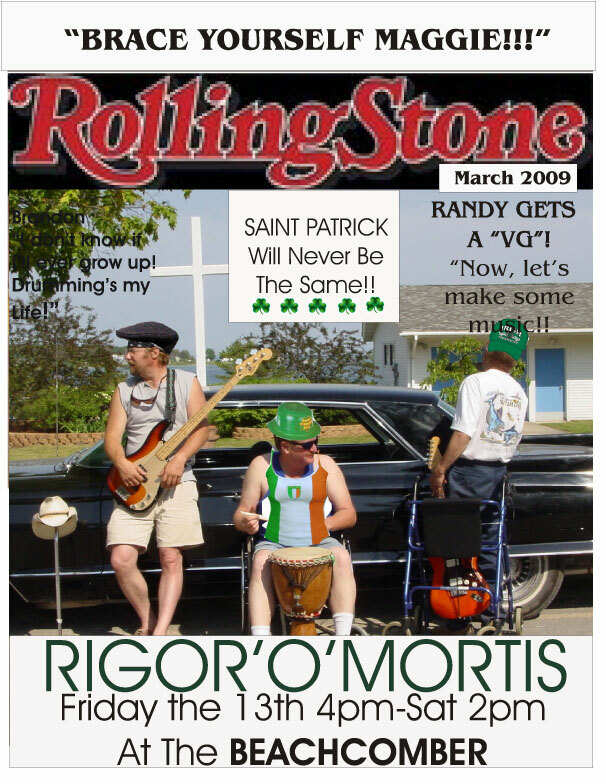  March 14 th – St. Patrick's Day Celebration and Contest Awards! 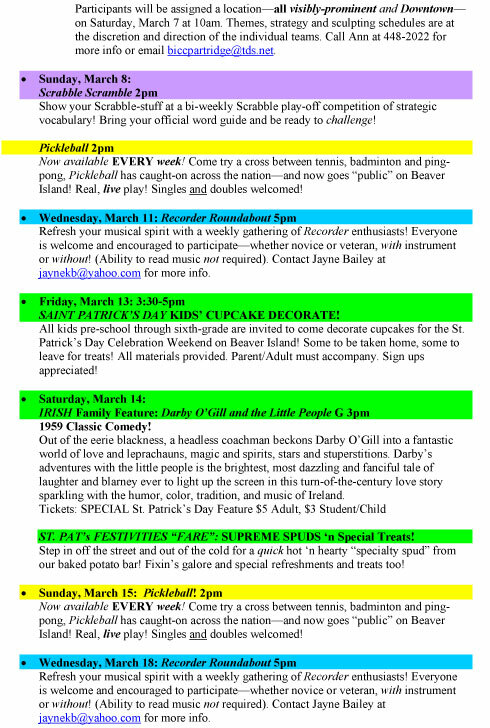 SAINT PATRICK'S ARTS CONTESTS! SIGN UPs BY Friday, MARCH 6 @ 5pm! JUDGING Friday, March 13 @ Noon! PRIZES Awarded Saturday, MARCH 14 @ Noon! Participants will be assigned to one of four teams and windows, given a theme, and materials on Saturday, March 7 at 10am. Prep and painting may begin on Saturday from 12 to 6pm, Sunday from 11am to 1pm, and Mon-Thurs after school until 6pm. Call Cindy at 448-2022 for more info! Participants will be assigned a location— all visibly-prominent and Downtown —on Saturday, March 7 at 10am. Themes, strategy and sculpting schedules are at the discretion and direction of the individual teams. Call Ann at 448-2022 for more info or email biccpartridge@tds.net . 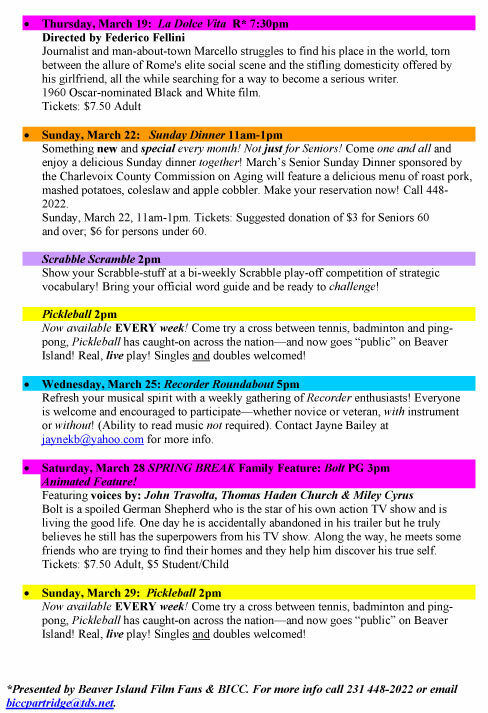  Sunday, March 8: Scrabble Scramble 2pm Show your Scrabble-stuff at a bi-weekly Scrabble play-off competition of strategic vocabulary! Bring your official word guide and be ready to challenge ! 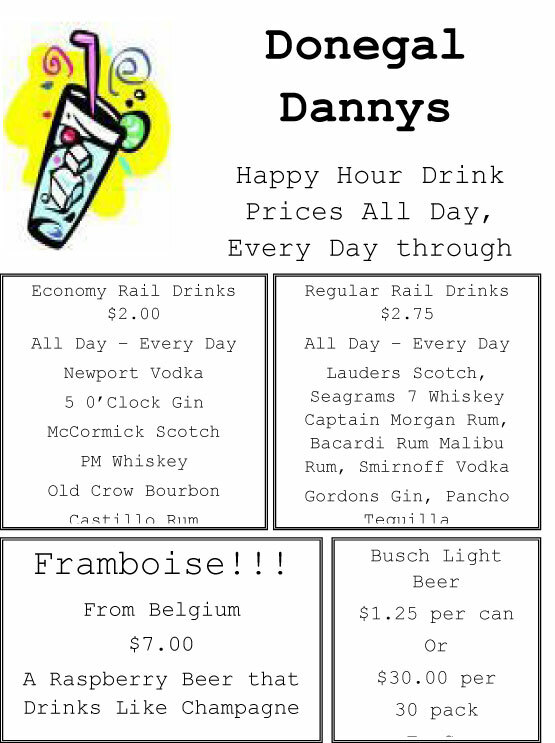 Now available EVERY week ! Come try a cross between tennis, badminton and ping-pong, Pickleball has caught-on across the nation—and now goes “public” on Beaver Island! Real, live play! Singles and doubles welcomed! Refresh your musical spirit with a weekly gathering of Recorder enthusiasts! Everyone is welcome and encouraged to participate—whether novice or veteran, with instrument or without ! (Ability to read music not required). Contact Jayne Bailey at jaynekb@yahoo.com for more info.  Friday, March 13: 3:30-5pm SAINT PATRICK'S DAY KIDS' CUPCAKE DECORATE! All kids pre-school through sixth-grade are invited to come decorate cupcakes for the St. Patrick's Day Celebration Weekend on Beaver Island ! Some to be taken home, some to leave for treats! All materials provided. Parent/Adult must accompany. Sign ups appreciated! 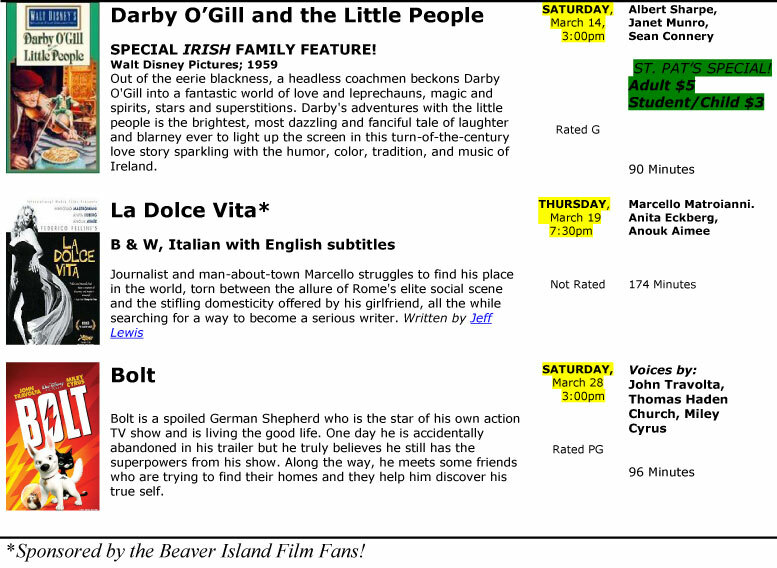  Saturday, March 14: IRISH Family Feature: Darby O'Gill and the Little People G 3pm 1959 Classic Comedy! ST. PAT's FESTIVITIES “FARE”: SUPREME SPUDS ‘n Special Treats! Step in off the street and out of the cold for a quick hot ‘n hearty “specialty spud” from our baked potato bar! Fixin's galore and special refreshments and treats too! Something new and special every month! Not just for Seniors! Come one and all and enjoy a delicious Sunday dinner together ! 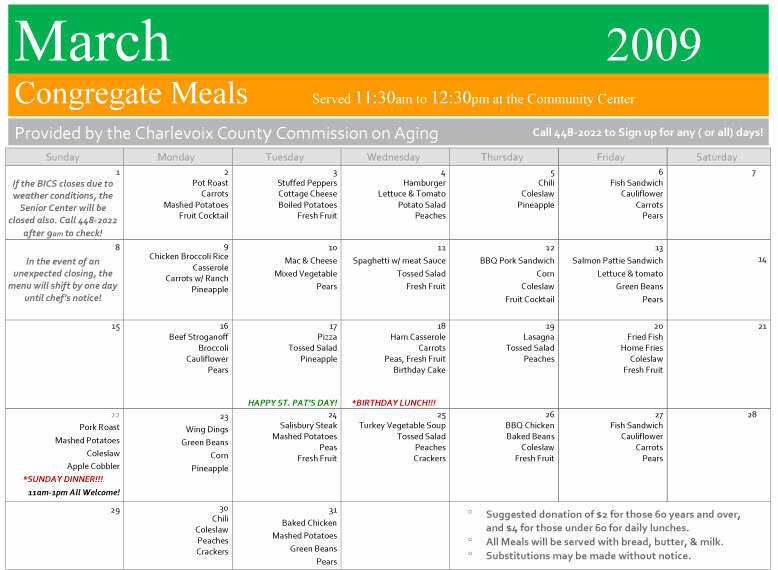 March's Senior Sunday Dinner sponsored by the Charlevoix County Commission on Aging will feature a delicious menu of roast pork, mashed potatoes, coleslaw and apple cobbler. Make your reservation now! Call 448-2022. Sunday, March 15, 11am-1pm. Tickets: Suggested donation of $3 for Seniors 60 and over; $6 for persons under 60. Show your Scrabble-stuff at a bi-weekly Scrabble play-off competition of strategic vocabulary! Bring your official word guide and be ready to challenge ! Can you name all of the owners of the Stoney Acre Grill starting with Liam and Marilyn Racine going all the way back to the beginning of its business history? Not too many interested in this particular question or just a lot of busy people getting ready for spring. One response was received from Joyce Bartels, which had most of the previous owners, but was missing the one who made the most changes in the restaurant. Joyce's answer included: Liam & Marilyn Racine; Roger & Nancy Sommer; Shannon Rafferty & her husband; and; Bill & Marge Wagner, the originators of the Stoney Acre Grill. Joyce forgot about Wanda and Dave Roop, who made many changes as well as Gary and Sam who tried, but were not successful at keeping the business going. Who is the organizer of the St. Patrick's Day Games that has been doing the games consistently for the last 23 years?